Trade liberalisation across five south Asian countries would result in a consumer welfare gain of at least $597 million to India and $2 billion to the region, says a study by think-tank CUTS International. Consumer gain is defined as a difference between the total import expenditure and likely import expenditure if that country were to import products at a lower price from the region. The five nations in the study are India, Bangladesh, Nepal, Pakistan and Sri Lanka. The study, titled ‘Cost of Economic Non-Cooperation To Consumers in South Asia’, covered 355 product categories under the South Asian Free Trade Agreement (Safta) and are not subject to tariff reduction. The study does not cover the Maldives, Bhutan and Afghanistan, also a part of Saarc. The gains would result from savings on the expenditure on imported products from other countries in a select category of products, if such products are sourced from within the region. The study also said the Safta had failed to enhance the growth of intra-regional trade due to limited tariff preferences extended to a country’s trading interest, limited depth in tariff cuts and prevalence of non-tariff barriers. Interestingly, India would get at least 92 per cent of the consumer welfare gains from Pakistan, according to the study. On products, it said plastics and plastic products would get nearly 90 per cent of the consumer welfare gains in India. Of the total gains to consumers, India’s share is estimated the highest, at 31 per cent, followed by Nepal at 23.4 per cent, Bangladesh at 20.4 per cent, Sri Lanka at 14.81 per cent and Pakistan at 10.58 per cent. Though Pakistan receives only 10.5 per cent of the total gains, the lowest, it saves 59.04 per cent on its current import expenditure on select products. The study said intra regional trade in South Asia represented only five per cent of the overall trade flows, which is a drag on the economic growth. It also said progress in easing trade barriers was possible through simplifying banking facilities for import financing, developing better communication and transportation infrastructure, simplifying visa procedures and improving information and support for traders. 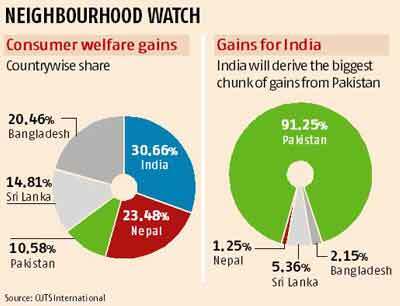 The study comes amid talks of Pakistan granting India the status of most-favoured nation. Yesterday, Pakistan had issued a negative list of 1,209 items. The new list means 6,000 more items can be exported by India to Pakistan.